The documantation for download can be found in my website. The audio signal flows unaffected through IC1A/B. When the compressor - limiter kicks in the inverted signal is added (=subtracted) at the summing node of IC1A. The signal level to subtract is regulated through a Sims VCA. The CV generation for the VCA is pretty standard. Linear for the compressor and exponential for the limiter. 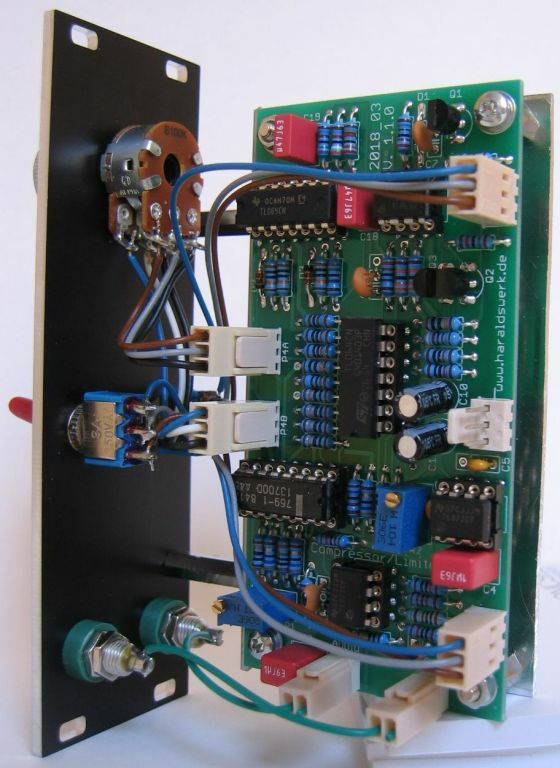 Precision full wave rectifier with filter to generate the control voltage for the VCA from the audio signal. I'm just about to start building I was wondering what component changes for 12v, I'm guessing around the offset voltages before U4a and U4c? Very nice and original circuit with love for the detail! It should work with +/-12V without changes. You will loos some headroom and the SNR might be a bit lower. The offset voltages are not the problem. 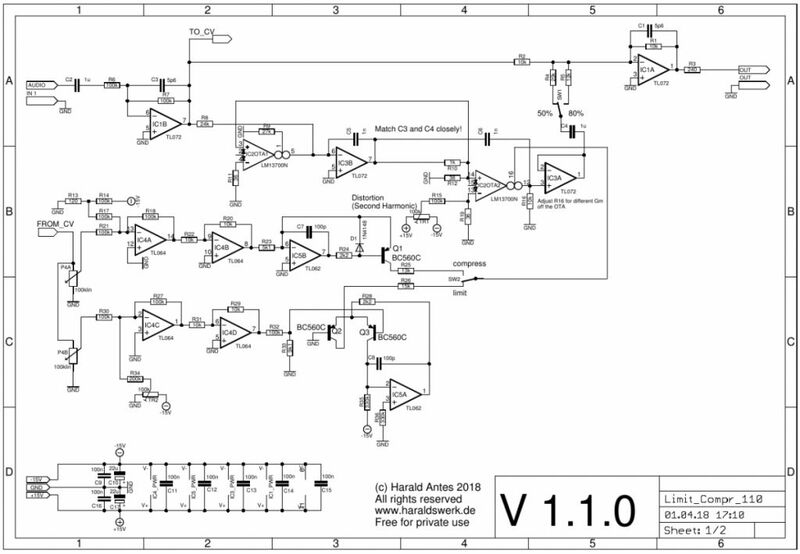 The slightly negative offset for IC4A R13/R14 ensures that the VCA is really off with zero voltage input in compress mode. If not you can increase R13 slightly. The offset for IC4C is easily trimmed with TR2. Generally when moving from 15V to 12V with OTA most problems are caused by the change in Iabc. If you run into problems here lower R27 to 24k and R25/R26 to 12k or 11k. But first try the original values. You have to adjust R10 anyway for the different Gm. This should be sufficient to compensate for the lower Iabc as well. If I find the time I can pull mine out of the rack and put it on the bench to test with 12V. Just checked the module with +/- 12V. It works with no problem. You will loose a bit of resolution with the rate pot. There is no effect within the last 20%. You should be able to resolve this by lowering the Iabc limiting resistors from 13k to 11k. Sorry I got sidetracked and had to debug a bit. I seem to have the same issue on both my pcbs where the inverted signal is being amplitude modulated to the point of waveshapping. Both units are outputting the full rectified input signal with no smoothing before hitting the vca, at least that's what it looks like. Just to clarify IC6B is supposed to be smoothing out the rectified signal correct? Looking at the schematics, I wondered whether IC4 stages are somewhat redundant? I mean they're effectively inverting twice, scaling a little and adding offset - so I wondered if that couldn't be achieved direct into IC5B and Q3? Curious to hear how it functions - is no makeup gain required? Sorry, I should have mentioned it is in the second edition. R25 (13k) sets the maximum Iabc and R23 (5k1) sets the saturation to avoid clipping of Iabc. So you have a input resistance of 5k1 for the constant current source. Usually this Ri is not sufficient for general CV inputs. So I just took my often used circuitry for CV inputs with high Ri (100K). I didn't want to mess up the constant current source. In this case here your suggestion might work because the input is derived direct from the PFWR and Ri is not an issue here. The input signal is inverted and routed in parallel through the VCA. Then added back to the original in dependence of the signal voltage which steer the VCA. 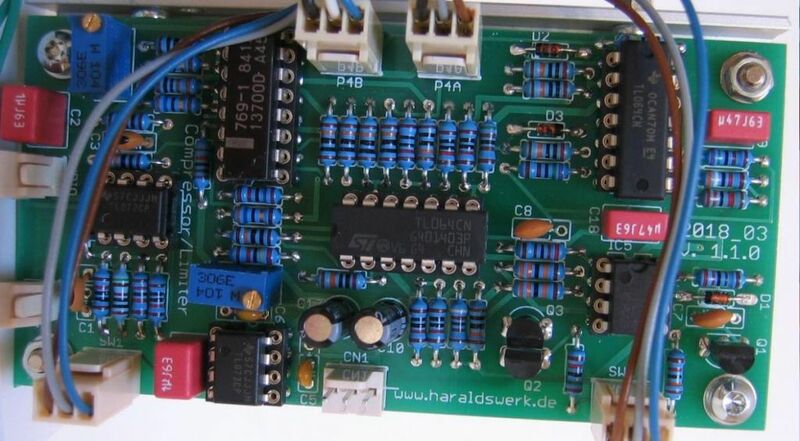 This device is build for my Shak 2 Synth project. So no makeup gain is required here. It could be easily added. Just make the gain of the last stage variable. I almost made a Eurorack module based on a old Compressor/Limiter a company I used to work for made (the Symetrix 501), and sell it as a "Speaker Saver" module for modular users. Something that would be the last module on the chain and sit there and do nothing, until the accidental speaker killing bleep or gronk happened, and stopped it from doing damage. I'm amazed nobody makes a good hard limiter for this purpose. I thought about putting back-to-back clipping diodes (probably LEDs) on the output jack of my output module. As a hard limiter to save my hearing. 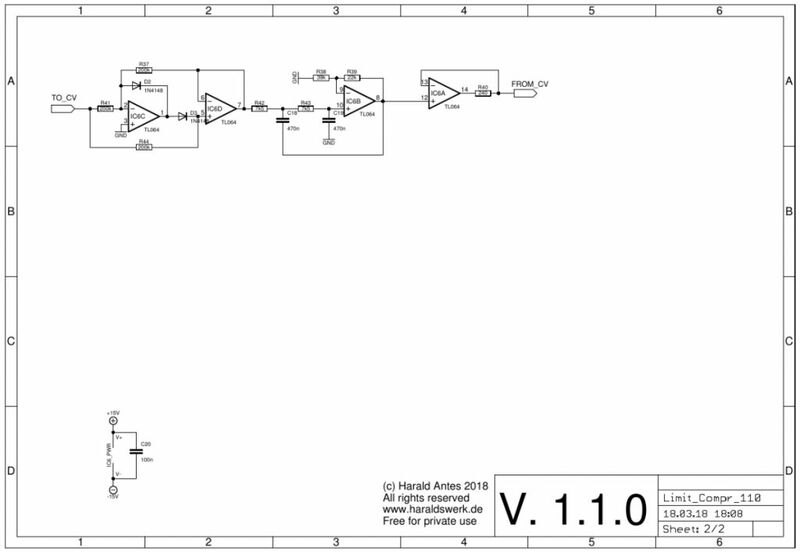 Ok maybe not LEDs because i would need a lot of them, maybe a zener with a breakdown voltage around 7-8V? Good hard limiting (and compression) is not easy to do and requires much circuitry to deal with different signal content. It is not voltage limiting/clipping but very fast and very accurate level correction. Limiting is Compression with a very large ratio. The heart of a good limiter/compressor is built around a good RMS converter that can convert the varying levels of the input signal into a decent control voltage to run the internal VCA. Think of a REALLY good envelope follower that can react fast to transients like drum hits, yet doesn't "flutter" with low frequency bass signals. The RMS converter is the core difference between compressors. How this output signal is conditioned makes the other differences like "soft knee" and others. To do a limiter right, it has to react fast and clamp down the VCA the right amount (not just turn it off) and go away just as fast as it came on so the results sound like the signal just never got louder than the output level you set. This can be abused of course by setting the input/output levels very low so all the dynamics are removed from the signal, but is set correctly, the listener will not even know it was even there.